Margarete Steiff first began making soft toys in the 1870s. Confined to a wheelchair since the age of two, due to polio, she became popular with the children of Giengen, her hometown in Germany, with her happy stories. She owned the first sewing machine in the town, and using the skills she learnt as a dressmaker, first produced a felt elephant in 1877. Soon after, many children were receiving gifts of felt animals, hand-made from scraps of felt from her mother’s family’s felt factory. Her popularity soon extended across southern Germany. The success of her enterprise attracted toy buyers from around the world. She had a good business sense and increased production to meet the ever-growing orders. Demand necessitated that she open her first factory in 1889, known as the Felt Toy Factory. She made sure it was well-lit and airy. Notably, it had glass walls, so that workers could see the nearby hills as they worked! Three of her nephews acted as managing directors, and were also astute businessmen. From 1880 to 1897, the business continued to grow at a steady rate. In 1897 another nephew, Richard, joined the firm, who had finished art studies in England and Germany. He chose to study and sketch the brown bear cubs in Stuttgart Zoo. These sketches formed the design for the first stuffed toy which had moveable parts, a bear, introduced in 1902, the Bar 55 PB, which was subsequently registered in July, 1903. In 1903 the first shipments of jointed teddy bears went on sale in America. Soon after, they were christened “Teddy’ bears, after the President, Theodore Roosevelt. They became highly popular with both boys as well as girls, and by 1908 were also very trendy for adults! Margarete would individually inspect every toy before it left the factory, to ensure the highest quality. 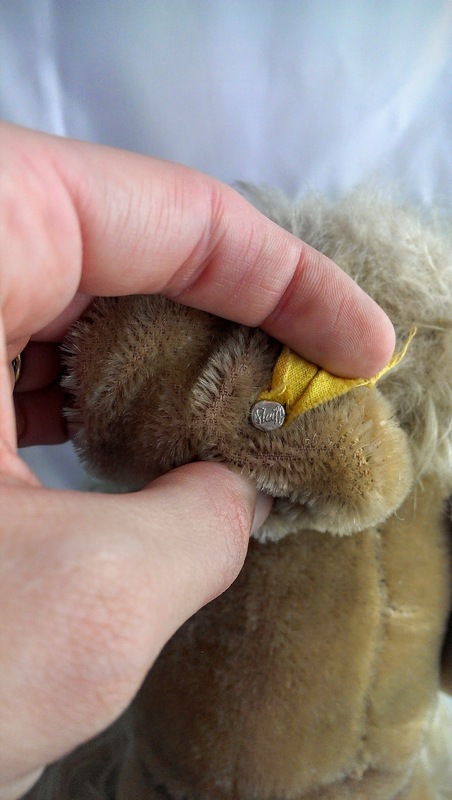 Imitations began to appear, and so in late 1904 a metal button embossed with an elephant was attached to the left ear to show that each toy had been inspected and found to be perfect, as a quality control measure. In May, 1905, however, the buttons were then embossed ‘STEIFF’. By 1908, two thousand employees were needed to meet demand, in two huge factories. Then, as now, most of the work was done by hand. Giengen grew rapidly due to the success of Steiff. Appreciation and admiration for Margarete is now shown in the naming of its main street after her. Today, Steiff is still known for its innovation, superb quality and extensive range. 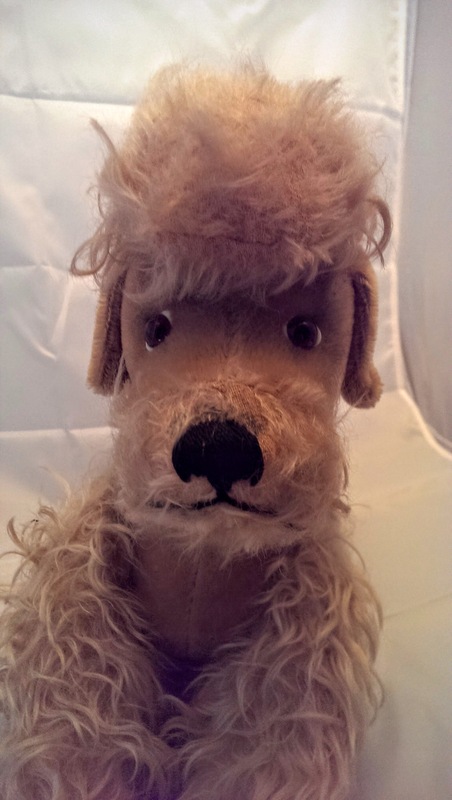 Vintage and antique Steiff teddy bears and animals therefore command high prices. Dating of each toy is possible through the button in the ear, as these varied over the company’s 130 year history, as well as by the materials used, and by reference to the old catalogues and advertisements. You have kept him in great condition! He appears to be the medium size, and of the rarer colour. Unfortunately, collectors will pay a much higher price for Steiff animals that have their IDs, though because he is older he is still very collectable. Though the internet has lowered overall values, he would sell on ebay for $40-$60, and in an antique shop or fair for $60-$90. Did. 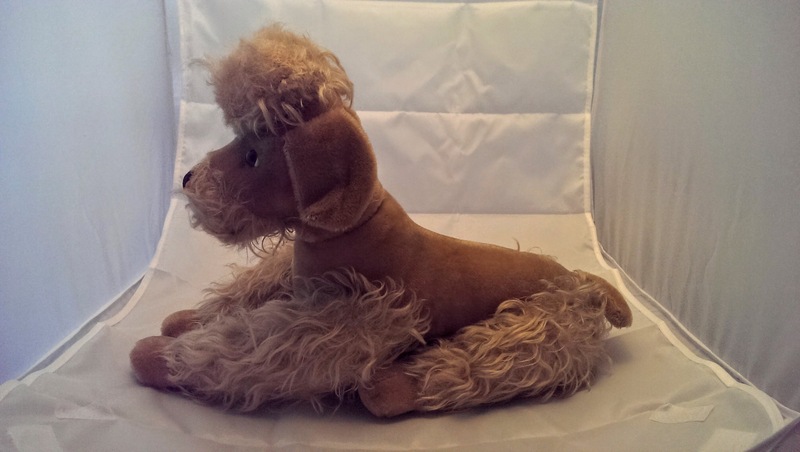 Steiff make a stuffed camel in the 1940’s? Yes, Steiff produced a large range of animals at this time, including mohair camels, elephants, dogs, cats and bears. During the 1950s it also released a full zoo range. 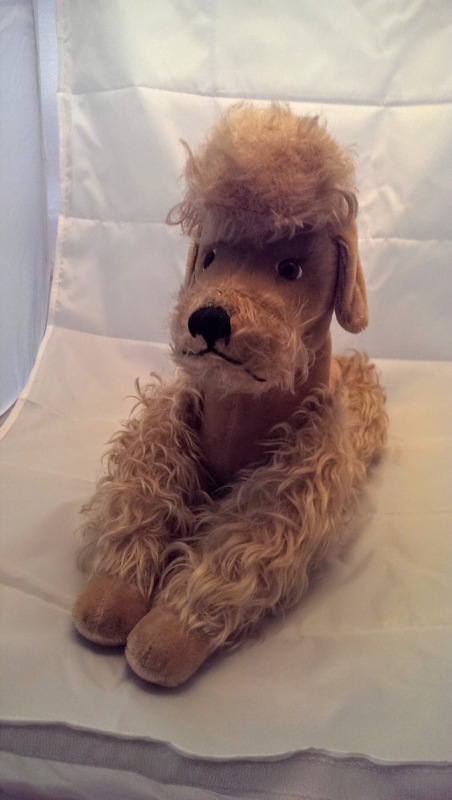 Vintage Steiff animals are very collectable! I recently purchased a Steiff duck. I’m wondering if you can tell me anything about it. The tags and button are intact and the information is as follows: The front tag says Waggi and the button tag says Knopf Im Ohr. The number on the tag is 3240/20. My duck has white fur where the wings and tail are. Can you also tell me the best way to clean it, or is that a no-no? He sounds cute! Steiff have made some wonderful ducks over the years! The gentlest way to spot-wash him is to make a very dilute mix of water and soap and dip the corner of a cloth into this. Gently wipe the area then dry with another cloth. This will protect the cardboard tag! 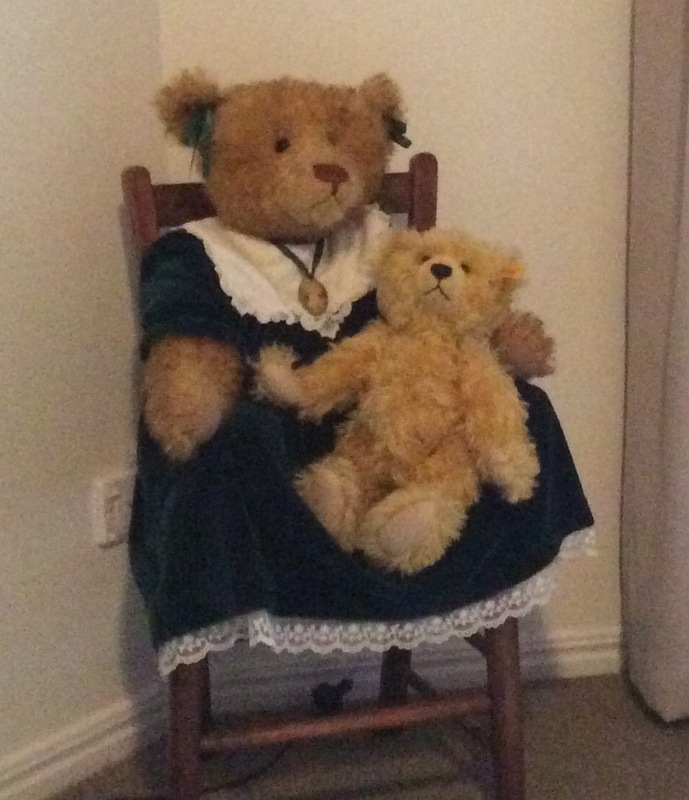 I picked up this bear in a charity shop in Australia last week, so know little about her. She is approx 65 inches at tall and quite heavy at 3kgs. She has a schulte label on her rear and suede one that I can’t read but is perhaps foreign/old style hand writing (photos attached) She doesn’t growl and has moveable limbs and head. Her eyes seem to be very dark brown with black pupil though it is difficult to tell (I would say they are the same as the steiff bears). Her head is quite oval with the eyes deep set creating a ‘brow’. The feet are possibly felt – it’s a thick fabric, but not suede. The dress is a heavy velvet with no signs of wear and the ear ribbons and neck ribbon with pendant all match. She has stitched paw/claw markings on her hand and her feet with the stitches starting on the felt and going over onto the mohair for approx 2 inches on all paws. She has a pronounced hump, the bear sat on her knee is a steiff and she has a similar appearance. I have checked her ear but I can’t find a hole, though I don’t know how big that would be from a removed button (hole or pin prick). When I squeeze her abdomen there is almost the sensation of some ? small beads there (perhaps for weight), and her limbs feel very firm. She has a bigger abdomen than chest. 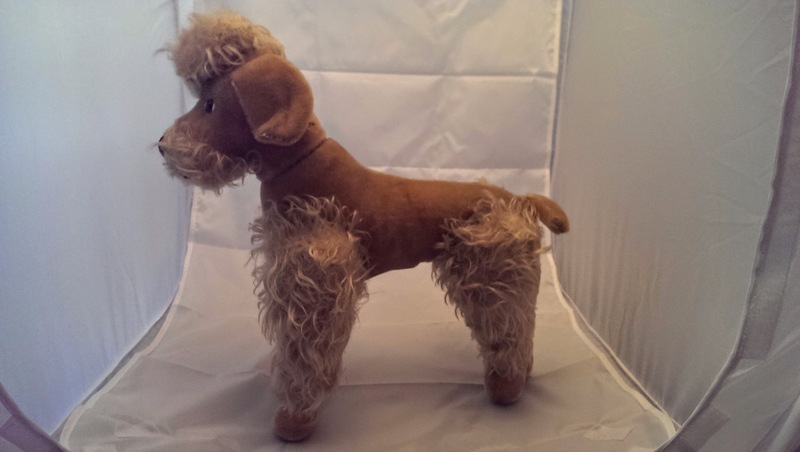 The nose is very tightly sewn on more on top of the nose than on the end, and has a slightly thicker line that connects to the mouth than the steiff one. The nose has the same fur has her body (the stieff’s is shorter on the snout)The ears are round and hollow (like the steiff’s). There are no other identifying labels on the bear or the clothing. I believe your beautiful teddy was hand-made by Lexie Haworth,( ‘The Bears of Haworth Cottage’), a very well respected teddy bear artist in Australia! Her signature is on one label, and the German fabric she used is the other, ‘Schulte’. We have met her at Teddy Shows and her teddies were very popular and expensive. Lexie attended her first show in 1992. She was inspired to create big Steiff-like teddies, after ‘accidentally’ selling a rare Steiff teddies for a bargain price! She has been commissioned on several occasion by David Jones to create commemorative teddies. 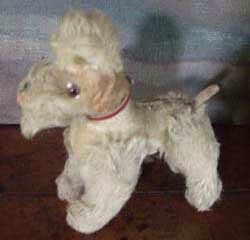 I was referred to your site in my search to identify a Steiff Poodle! I hope it’s alright to ask you for some help identifying him. I have done some research but haven’t found an exact match yet. I’ve been told he may be pre-1947. ​It has glass eyes, and a sewn nose and mouth, there is no evidence of a tongue sticking out, I’m sure there was a collar at some point but it’s been lost to time. 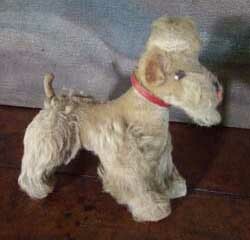 It has the original Steiff tag in the ear and measures ​17 inches from nose to tail, and 15 inches from ​the top of his head to the floor when standing​. The legs swivel at the hip and the head does turn. It’s stuffed with something quite crunchy and hard.